The Arlington Artists Alliance has a juried collection of works on display at the Century 21 Gallery through March 31. Among 115 paintings submitted, 45 were selected to be shown. The paintings encompass a wide range of styles and subjects. Juror Ross Merrill selected Cindy Gilmour's "All Shook Up" as Best in Show. This large, vibrant cityscape is visible at the center of the above photo of the opening reception on March 7. The opening reception filled the gallery with friendly people. Just an hour after the reception started, Bee Jee Juhnke's Prairie Sky II had already been sold. If you want to see some good, local paintings, head to the Century 21 Gallery. If you want to buy some good, local paintings, head over there right away! 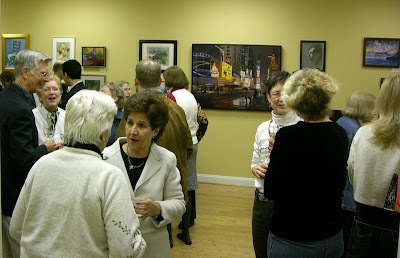 The Century 21 Gallery is at 1711 Wilson Blvd, in Rosslyn one block up from the fire station. For more information, call 703-589-8245.